Viknesh Vijayenthiran September 15, 2015 Comment Now! 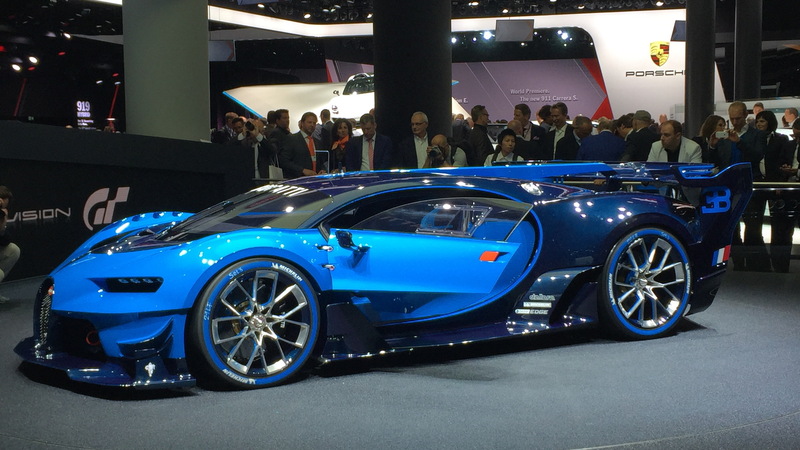 Bugatti has joined the pantheon of automakers taking part in the Vision Gran Turismo video game challenge, with its design taking the form of a stunning supercar-turned-racer. 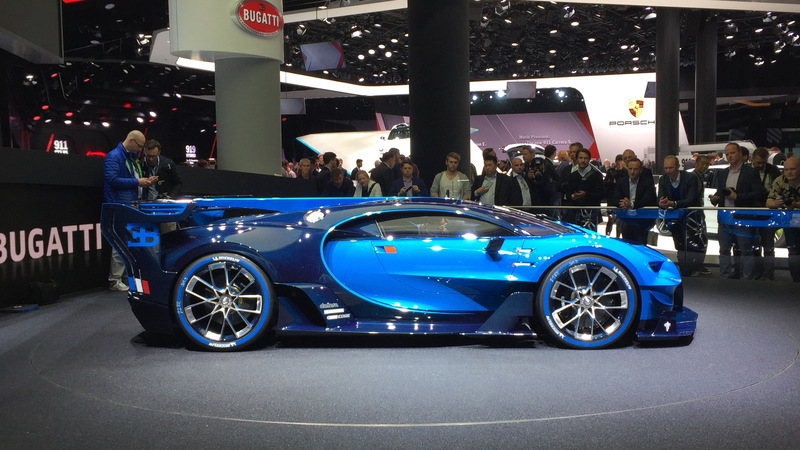 Crucially, the design is a preview of Bugatti’s Veyron successor, an even faster model currently thought to be called a Chiron and likely due for a reveal at the 2016 Geneva Motor Show next March. 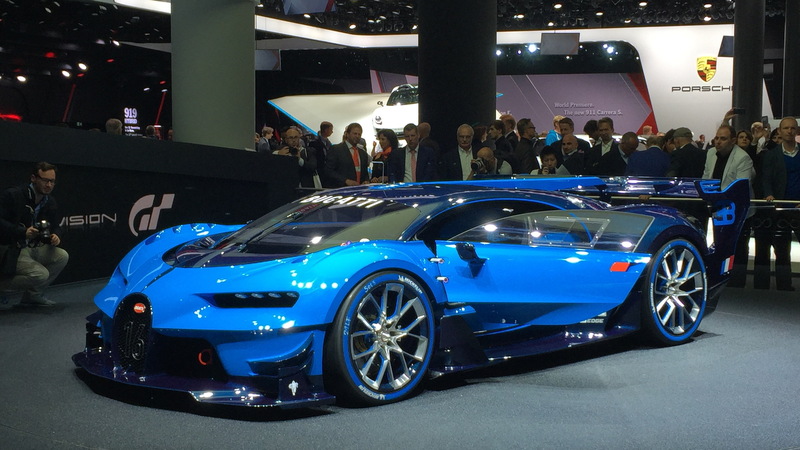 As for the Bugatti Vision Gran Turismo concept, it was unveiled in life-size form at the 2015 Frankfurt Auto Show. The Vision Gran Turismo challenge it is part of was set by the Gran Turismo racing sim’s creator Kazunori Yamauchi back in 2013. He asked design studios from all across the globe to come up with a car that best embodies the spirit of the game, and which fans would be able to download as a drivable car in the latest iteration of the game, Gran Turismo 6. Bugatti was keen to emphasize its motorsports history with its concept, with the design said to have been inspired by the marque’s victorious Le Mans racers of the 1930s, namely the Bugatti Type 57 Tank. Consequently, the Bugatti Vision Gran Turismo makes its appearance in the classic blue two-tone finish of the Type 57 G Tank that won overall at the 1937 24 Hours of Le Mans. 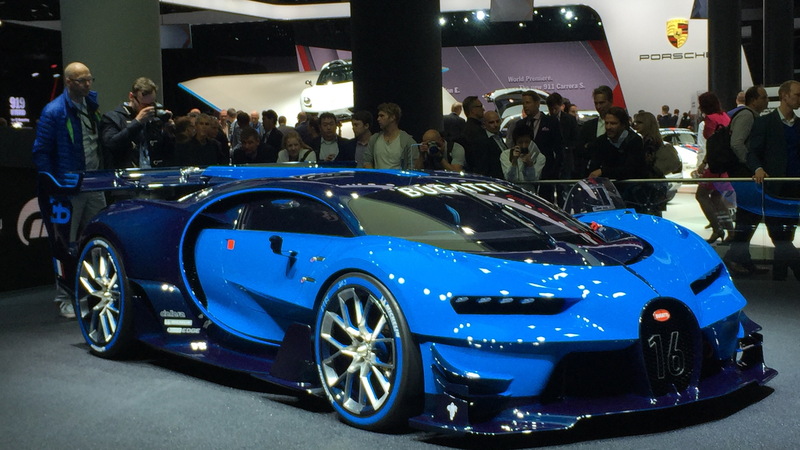 At the same time, the concept is said to feature state-of-the-art motorsport technology and also preview Bugatti's future design language. There are numerous aero elements around the body, including an impressive rear wing with supporting fins as well as a giant NACA duct on the roof. 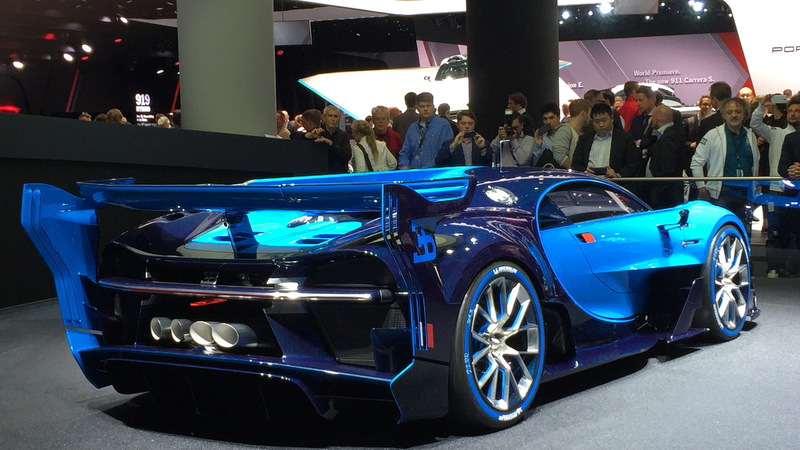 But look past many of these wild elements and you’ll get a sense of what the Veyron successor will look like. Up front is a prominent horse shoe grille, which sits in the center of the central front air intake as a three-dimensional sculpture and supports the structure between the wings and the aerodynamic front splitter. Then there’s Bugatti’s signature fin running the length of the car, and at the rear is a muscular series of shapes that looks similar to what we’ve already seen on a prototype for the Veyron successor. Power comes from Bugatti’s quad-turbocharged 8.0-liter W-16 engine, and on a virtual lap of Le Mans the engineers claim the concept should be able to hit 250 mph at no less than four sections of the famous track. Keeping the car on track is an all-wheel-drive system, a Formula One-inspired drag reduction system and a massive air brake. Just as with the exterior, no comprises were made when it came to the design of the vehicle's interior. The striking center fin of the roof is echoed in the cabin, where it divides the cockpit from the rest of the interior and merges with the central console below. There are two displays for the driver, one on the steering wheel that shows all the relevant vehicle information plus a second display located on the steering column that combines the images from three cameras mounted on the exterior of the vehicle to provide the driver with a better view of the outside world. For more from the Frankfurt Auto Show, visit our dedicated hub.